Preliminary data indicate that the number of diagnosed cases of Lyme disease in Nova Scotia grew dramatically in 2015. 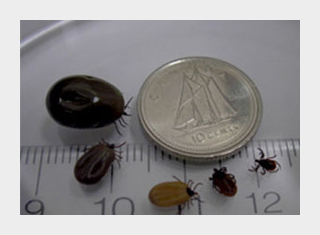 Black-legged ticks (also known as deer ticks), the species of tick that carries Lyme Disease, can now be found almost everywhere in Nova Scotia. HRM is one of the province’s hot spots. The growing threat from the disease has produced a major response from the federal government. The federal Department of Health just held the Federal Framework on Lyme Disease Conference in Ottawa, May 15-17. Parliament passed legislation in 2014 calling for this conference to work on the creation of a national database tracking the disease, national guidelines for treating the disease, and a national educational campaign about the disease and prevention. Lyme disease can produce a bewildering array of symptoms. In some people, the first indication of a bite is what’s called a “bulls-eye” rash, an inflamed area that looks like a crudely drawn bulls-eye target. But many people never experience this rash, and the blood tests for the disease are unreliable. In Nova Scotia, the provincial Department of Health and Wellness guidelines tell physicians to rely on a clinical diagnosis, rather than the less reliable blood tests. The standard treatment for an early diagnosis is usually a few weeks of antibiotics. There are a number of “natural” or “organic” products for sale that claim to repel ticks, but there is very little information available on whether these products are effective. According to the U.S. Centers for Disease Control, “Repellents containing DEET, picaridin, IR3535, and some oil of lemon eucalyptus and para-menthane-diol products provide longer-lasting protection” against mosquitoes. The most common commercial synthetic chemical defense against ticks is DEET, which is usually sold as an “insect repellent.” DEET can be harmful to humans, and should not be used on infants under 6 months. Veterinary doctors also sell products to keep ticks off dogs and cats. Many tick fighters now recommend a synthetic insecticide called permethrin, which can be applied to clothing. Permethrin is relatively safe for use by people, and is used in products for dogs. But permethrin is deadly for cats, honeybees, fish, and aquatic life. In selecting clothing, pick light-colored fabrics that make it easier to see small ticks. Putting a ring of double-sided tape around the top of your socks will pick off ticks climbing up your socks. Tuck pants legs into socks, and shirts into waistbands. On the footwear front, skip those comfortable open-toed sandals. Rubber boots are good for working in the garden. And for one more layer of protection, after you’re done inspecting, take a long bath. (And don’t forget to inspect your pets!). After you come indoors, there may be ticks that were still climbing into position to bite you in your clothing. Some authorities recommend running clothing through a hot dryer for at least 10-20 minutes as a way of killing off ticks that could be hidden in creases of your clothes. Provincial: The Nova Scotia Health and Wellness Department has a web page devoted to Lyme Disease: http://novascotia.ca/dhw/cdpc/lyme.asp.